Active investing vs passives: what’s right for Irish savers? There’s a revolution going on in the global investment industry right now. Passive investing is eating active managers’ lunch. A deluge of money is being taken out of actively managed funds, and placed in passive, or index funds. Those highly-paid people in pinstripes are losing out to computers which can be set to track an index, such as the ISEQ 20, FTSE 100, or S&P 500. The US is leading the charge. 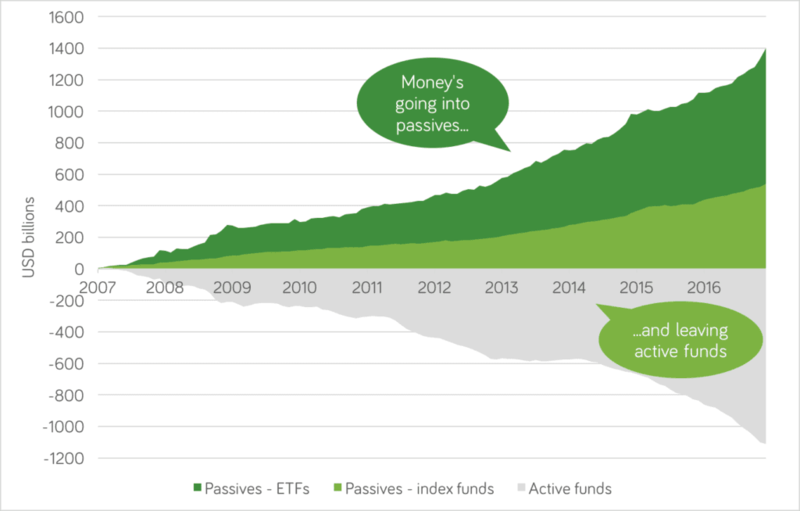 The chart* shows a massive rise in passive funds (both index funds and exchange-traded funds, or ETFs). The decline in actively managed funds is a near-perfect mirror image. Who’s winning, and who’s losing? It’s bad news for the fund managers. For a long time these guys trousered large percentage charges for managing people’s money, unnoticed. And on the whole, the challenge to active investing is good news for investors and anyone with a pension. More of your money is going to work for you. Less is getting eaten up in charges. So should we all focus on passive investing? In Ireland, the management charges, tax arrangements and transaction cost benefits of passives are less compelling… so far. Compare that with the US, passive investment instruments can be got for annual management charges under 0.1%. Here, many passive funds still come in around 0.75% or even higher. For that price (0.75%), you can buy actively managed funds through Moneycube. Investing in passive instruments also makes it harder to manage your portfolio. You’ll likely incur a tax charge every time you sell, even if it’s to re-invest. (Here’s a good summary from Gillen Markets of the tax position on ETFs). You’ll also probably face a stockbroking fee for trading your ETFs. On the other hand, Moneycube can access several good-value managed funds which offer good flexibility. Here, you can adjust your appetite for risk and reward (either because it is in an insurance wrapper, or contained in a single sub-fund), and avoid transaction costs for buying and selling. So for now, the biggest benefit to Irish investors of the rise of passive investing is light it shines on the actives, forcing managers to improve their performance (and their costs). However you choose to do it, the rise of passives is driving down the cost of investing your money. There are three reasons behind the move to passive investing: better information, better performance, and better pricing. Firstly has come the revelation that many active funds are really ‘closet passives’: that is, really just reflecting an index, with little investment judgement being applied. In that situation, you’re paying chunky asset management fees for little or no benefit. On top of that, many actively managed funds underperform the benchmark they set themselves. One report found nine out of 10 UK equity funds missed their benchmark in 2016. And lastly, in the US at least, financial advisors are moving away from charging big upfront commissions on investments (which many fund managers facilitated). The trend is towards charging a fee directly (either an hourly rate, or an ongoing percentage of the investments under administration). That’s good, because the prospect of an upfront commission will no longer influence the advisor’s recommendation. Things are a little slower to change in Ireland, but Moneycube is leading the way to clearer charges for customers. And alongside the performance, cost benefits, passives do present some problems. Doing things on autopilot can lead to some strange decisions. If you’re following an index, you have no choice over what to buy. That’s why the index trackers forced to buy Snapchat shares when is listed in March have lost nearly half their money. High-cost active management is dead, and rightly so. It has never been a winning proposition for investors. * The chart uses information from the Investment Company Institute (page 46). It shows the cumulative flows into funds over the last 10 years, and covers US equity funds only.